Are you ready to get the essentials for Hair Growth? After interviewing experts in varied cultures, we assembled formulations of natural ingredients that were effective. This is the perfect package for relatively short hair, and no styling needs. GrowOUT Essentials are a fast start to removing synthetic chemicals from common shampoos and conditioners, and gives your scalp a healthy environment to empower hair that grows faster and healthier….naturally. 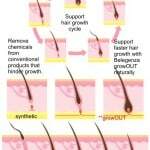 GrowOut Shampoo & Strengthener Removes buildup and chemicals that may be inhibiting growth. The shampoo should be used daily. Apply just a small amount and thoroughly rub into scalp and hair. (Just apply a “dab”.) GrowOut will not generate the suds that you are accustomed to. Bubbles are created by sulfates. 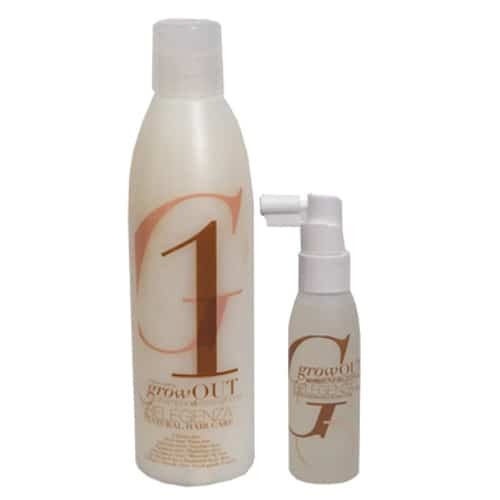 GrowOut Scalp Energizing Spray This spray is a concentrated blend of key ingredients. It should be used 1-2 times daily. Place nozzler on scalp, depress pump, and spread liquid around on the scalp with fingertips. Repeat until applied to all areas of the scalp and hairline. Please be aware that GrowOut Spray is not considered a hair conditioner. GrowOut Scalp Energizing Spray will assist detangling and nourishing the hair. It will do so progressively with continued use. The essentials products total $70.00. Belegenza uses only FDA approved food-grade ingredients. We never, ever, test on animals. Please note: when synthetics are removed from hair, tangling may occur. This is the main reason we also recommend DraMatic Daily Volumizing Conditioner. Should tangling occur, be patient and comb hair gently, especially when wet. *These statements have not been evaluated by the Food and Drug Administration. 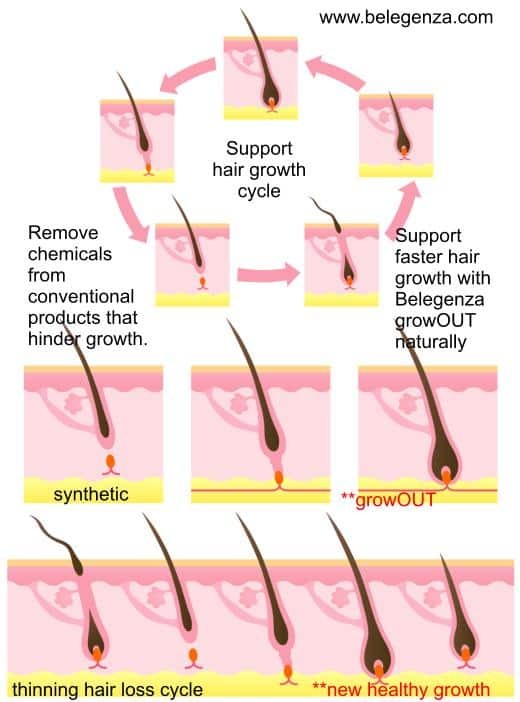 Belegenza’s products are not intended to diagnose, treat, cure or prevent any disease. LOVE MY GROW OUT PRODUCTS!!!!! Have been using now for over a year, my hairdresser commented last week on all the new hairs around my temple!!! I am “62” years old so having this product for my hair at post Menopause is important!!! I really like it! I think it is making my hair stronger and getting a little longer but nothing huge. My natural curls are definitely coming back when I get out of the shower, which I haven’t had for a long time! I tried another brand that had no sulfates, no silicones, and no this and that, but I’m back to GrowOUT and Belegenza and I like it! Though the other made me feel clean, it never left my hair feeling quite right. Now, I use Belegenza, and my hair feels and looks great, and not only that, it has lasted me 3 months already. I’m just now running out, and getting my next set of products. Awesome hair, and awesome value! I gave my daughter Growout for her hair, which was thinning and slow growing due to her stressful lifestyle, and she is thrilled. She said it’s thicker and growing faster than ever, so much so that her stylist commented on it, too! Now, I know what gift she’s always going to love getting…Growout!! Thank you Belegenza– I’ve been using the grow out spray, volumizing conditioner and grow out shampoo for around 4 years. I found your company by pure luck and it has changed my hair & the way I’m able to style it + it’s healthy thanks to the awesome ingredients that are in each bottle. I have 5 kids and used the grow out spray through each pregnancy except my first. I’ve had no hair loss each time I used it and my hair continued to grow unlike the time I didn’t use it. Extremely happy!!!!! Thank you! I had run out and can definitely tell the difference…My hair and I so love you both! I started with just the shampoo, and when I started to see some new hairs filling in, I figured this was going to help. It did, and I keep one in my gym bag, and one at home. I totally beat my sorority sisters at growing my hair out this past year. I chopped my hair off last September, and was growing it back, and then started using Growout exclusively since February, and in the 10 months, I’ve grown over 7 inches and it’s shiny and healthier than ever. That’s crazy! That’s like 3/4 inch a month, but I know it’s more since February. I should have measured because I can tell it seems to be more than 3/4 inches per month! Thanks, Belegenza! I have been using this along with the entire grow out system on my 6yr old daughter for 1.5 years. She has SAS and her hair has gone from fragile scarce wisps to thick curls. I am a believer! I can’t live without it! Really, I can’t tell you how awesome your stuff is. I have tried it all over the years. The list goes on and on. Nothing touches this stuff. OMG, thanks so much. “The Holy Grail of hair products” and I am passing your contact info to our key MUA! So, at the latest shoot I did the hair person mentioned how good my hair looked..that’s #belegenza I said. It’s thicker!